After you enter your details you will receive a download link and an email will also be sent to you. If you can’t see the email please check your junk folder. 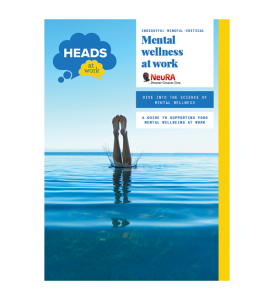 NeuRA has also developed a program for organisations called HEADS at Work that focuses on mental wellbeing and resilience in the workplace. Find out more about the Heads at Work program here or email info@neura.edu.au. NeuRA is an independent, proudly Australian not-for-profit medical research institute. Our goal is to prevent, treat and cure brain and nervous system diseases, disorders and injuries through medical research. NeuRAtalks is a series of seminars brought to you by NeuRA that brings new information on neuroscience research and translational science to the community. Can we train the brain to be more resilient? How does sleep impact mental health?